Netball is a popular participant sport in some parts of the world, particularly in countries of the Commonwealth of Nationals. According to the IFNA, over 20 million people play netball in 70 countries. In Australia alone it is estimated that 1.2 million people play netball. PERANA SPORTS recognised the need to develop analysis software that could cater for all levels of performance from club and school, to national and international level. 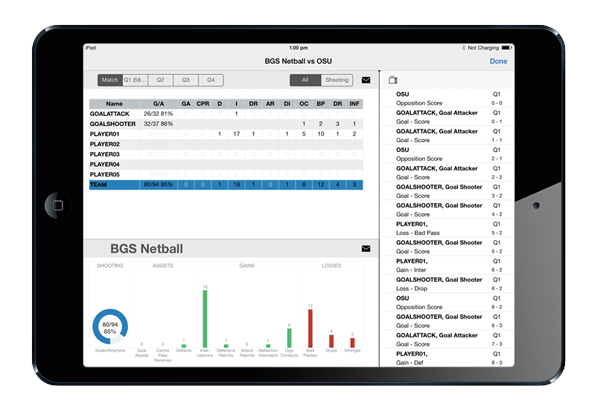 NetballStats is an iPad based program that allows coaches and players to record not only statistics, but also sync these to video to create a very powerful analysis tool. The format of the input allows you to record as much information as needed for the level of play. This makes it ideal for all level of netball. Statistics can be recorded either live or post-game from video. Once the video is loaded you will be able to see this on the video screen. The input pad allows you to records stats from the video and these are also recorded on the timeline. During the game statistics are dynamically updated. They can be viewed on the screen by player or team. They are also listed on a timeline. The input pad (bottom right) allows quick and efficient statistical entry. 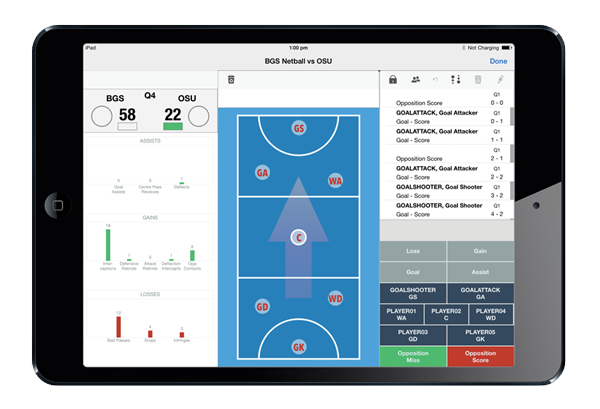 In-game statistics, once recorded can be viewed by quarter or by game. You can also view goal shooting. Statistics are displayed in a graphical form at the bottom of the screen. If you are viewing the screen post-game and video has been synchronised with the statistics, you will be able to view the associated video from the filtered list on the right side of the screen. 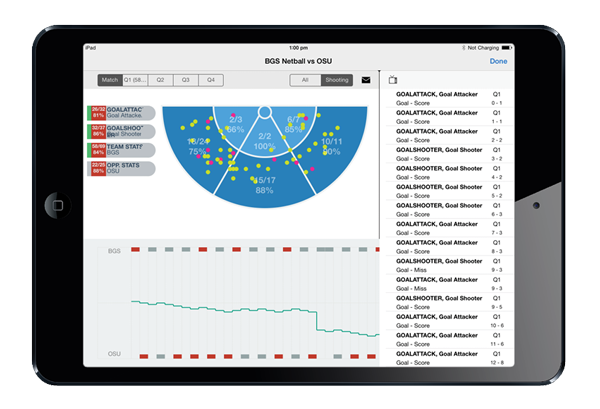 The effectiveness of the GS and GA can be viewed, as well as the scoring trends. Once again individual players or team shooting can be filtered and the events list (if video is synchronised) will be presented on the right allowing you to view associated video.